It’s funny how seemingly insignificant events can make life-changing impacts. I began my college career at Tulane University in New Orleans. It was 1958. A couple of years later, my daddy and I decided that his bank account and my education would both be better served if I were to transfer to a Texas state school. We picked North Texas State College in Denton; later to be named and renamed until it became the University of North Texas, what it’s called today. So I drove from Galveston to Denton, and the following day I began registration, thinking I probably didn’t know anyone at the school. But almost immediately I ran into a younger boy I had gone to high school with, Arnie Calhoun. It was good to see a familiar face. And especially since Arnie had already completed a year or two at North Texas. He knew the ropes. After registration Arnie said, “Let’s go to the UB -- what the Student Union Building was called in those days -- and hear the One O’clock Lab Band.” I had no idea what he was talking about. What was the One O’clock Lab Band? We walked into the front door, and there in the huge living room of the building was a student jazz orchestra comprised of at least sixteen pieces. Leading it was Leon Breeden, the school’s professor of jazz education, and standing at the front blowing the guts out of his trumpet soloing to “Stella by Starlight,” was trumpet prodigy, Marvin Stamm. The place was packed with students, most standing since there were few seats. And some were making every effort to dance “The North Texas Push” to the music. I instantly knew I had found my home. Soon and at my insistence, Leon Breeden and I became friends, even though I never once signed up for one of his classes or played a rift on the piano with any of his big bands. And that friendship continues nearly fifty years later. Mr. Breeden will be 88 this October and I’ll be 69 in June. Mr. Breeden took his One O’clock Lab Band to London, Paris, Portugal, Russia, Mexico Germany, Spain and Switzerland. The band played in most major cities throughout the U.S. and the Spoleto Music Festival. The band performed at the White House for the parties of Presidents Johnson, Carter and Reagan. They played for the U.S. visit of the king and queen of Thailand. It has accompanied jazz greats like Ella Fitzgerald and has produced new members for Stan Kenton’s and Woody Herman’s bands. Mr. Breeden’s students, in addition to Marvin Stamm, included Lou Marini, Lyle Mayes, Galen Jeter, Sparky Koerner, Marc Johnson, Byron Parks, Paul Guerrero, Lanny Steel, Dee Barton, Jim Riggs and Herb Ellis. And there are more than 600 recordings of the jazz band’s performances in the North Texas School of Music archives. 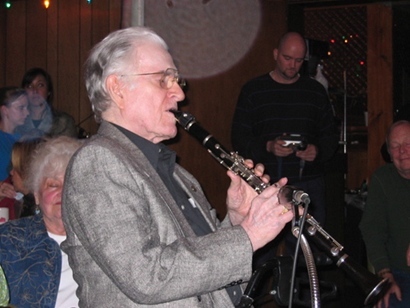 What is interesting is that Mr. Breeden and his Lab Bands did more to bring academic notoriety to what began as a small and insignificant teachers’ college, than, perhaps, any board of regents or college administration did before or during the more than twenty years he taught jazz music. In 1981 the Texas House and Senate unanimously voted to make May 3rd “Leon Breeden Day in Texas.” Six years later, after secretly planning to surprise Mr. Breeden with a Lab Band reunion, more than 400 of his former students came from world-wide locations to honor him. Actually, 400 plus one…it was one who had never played in one of his bands. Me, a piano player from Galveston who had profoundly found his college home years before when he heard Mr. Breeden’s band for the first time. For more than twenty years, I’ve been trying to convince the University of North Texas’ Board of Regents to name one of the academic buildings after Mr. Breeden. Maybe this is the year they’ll listen to reason.